WARNING: this page may contain pictures that are distressing for some persons. · Laxity or hypermobility of ligaments. 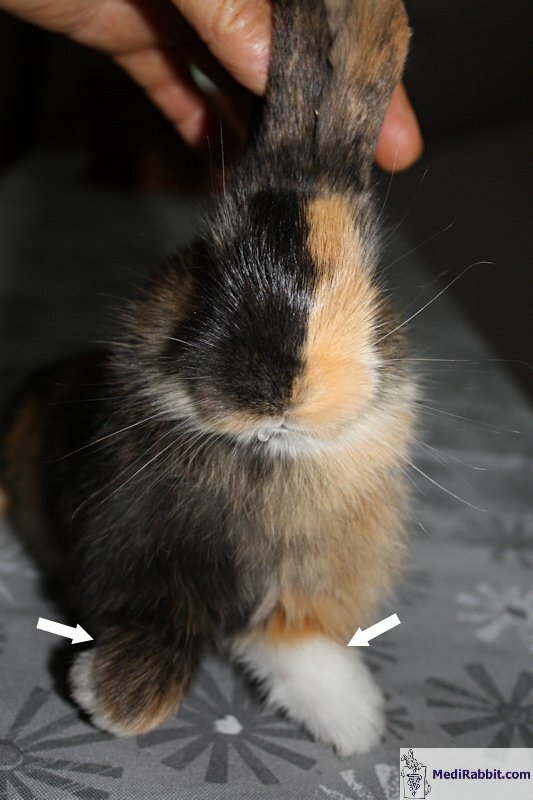 The etiopathology of angular limb deformation is not well documented in rabbits. In other animals, including foals, there are several bone or muscle related causes, while laxity (mobility) of the peri-articular structures and ossification retardation of bones have often a congenital origin. Growth of bones is influenced by a number of factors: genetic, hormonal (hypothyroidism), metabolic, but also vascular or electric and the failure of one of these can lead to an abnormal bone growth and elongation of the longer bones of the limbs. In young growing animals, an asymmetrical mechanical pressure (e.g. the weight of the body or slippery floor, when the doe keeps removing all the hay and other material from the nest) on growing cartilages of long bones of the extremities can lead to angular deformation of the joints with inward or outward deviation of the limb. In this case, the deformity corrects itself naturally once the rabbit kit is placed in an environment without slippery floor. A wrong diet of the doe at the end of gestation (nutritive deficiency, imbalanced food, intoxication) can also lead to limb deformation in her offspring. 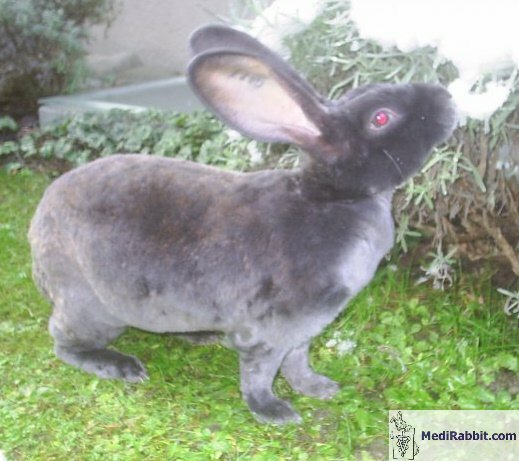 A hereditary origin related to a single autosomal recessive gene appears to cause bending of the upper limbs in some rabbit breeds: Beveren rabbits, Belgian giants, French Silver and Dutch rabbits. The curvature of the limbs appears at the age of 2 or 3 weeks. The upper limbs start to bend inwards, while the paws are deviated laterally. The deformity reaches a maximal stage at the age of 2 to 3 months. Even if the cartilage problem corrects itself naturally at the age of 2.5 months, the deformity is definitive with inward curvature of the ulna and radius (forearm bones, between the elbow and the front paw). Young Belgian hare presenting a valgus misalignment (in X) of both limbs at the ulnar joint (elbow) (top). 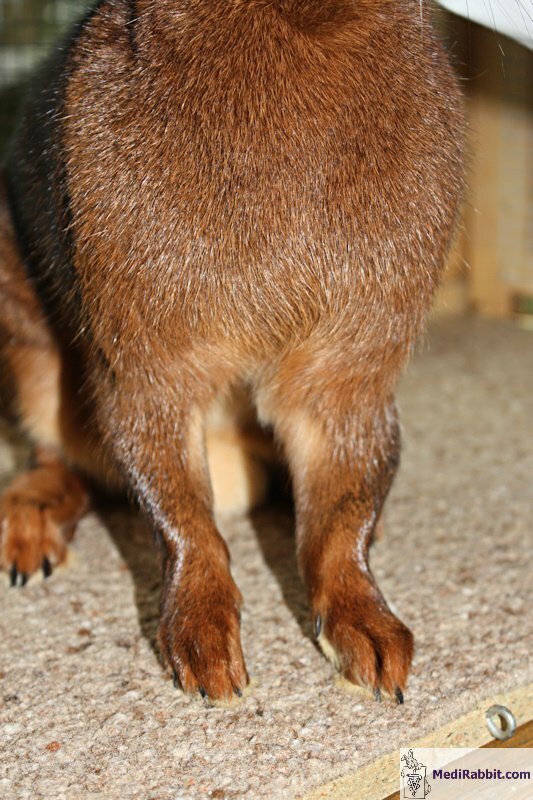 In another young Belgian hare, a carpal deviation is observed at the level of the foot, accompanied by a possible rotation of the rabbit’s front left limb (right limb on the picture). Young lop with varus (in O) misalignment of carpal joints in his two upper limbs. Osteo-articular deformities affect upper limbs more than lower limbs in rabbits. Exceptionally, an upper may be affected by a double deformity at the ulnar and carpal joints. It is usually present at birth or it appears later during growth, at the age of 2 or 3 weeks. Finally, angular deformities can be accompanied by the rotation of the limb. Ligament laxity. 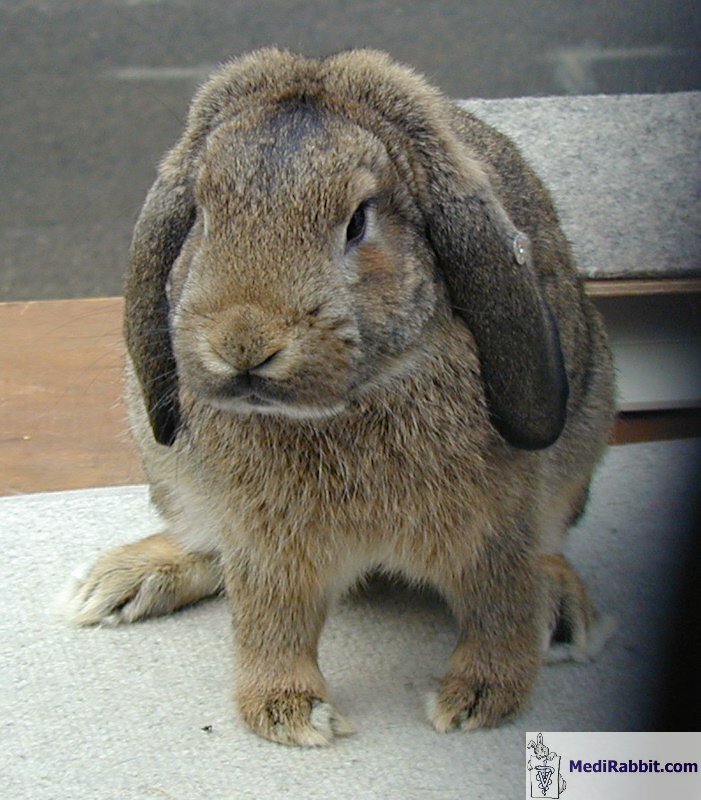 It is usually present at the newborn’s birth and does not cause pain, but may also appear later in the life of a rabbit. Morphology of the affected limbs appears normal on X-rays. This deformity disappears spontaneously in most foals. 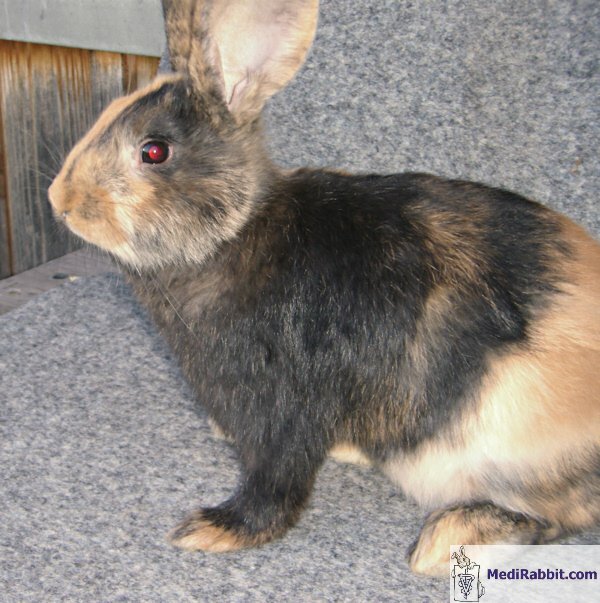 Rabbits suffering from this problem may develop juvenile arthritis accompanied by joint pain. In older animals, deformity of the limbs in the sagittal plane can relate to osteoarthritis. This syndrome is irreversible and painful, and the rabbit should be administrated analgesics. Treatment with glucosamine and chondroitin may also help. Side view of a Rex female rabbit with a sagittal deformation of the front limbs. One cause may be ligament hypermobility. Cuboid bones hypoplasia. The cuboid bone is part of the tarsal bones. It ossifies rapidly after birth. Thyroid dysfunction (hypothyroidism) is responsible for the lack of osseous development in foals, and hinders a normal ossification of the bones. A spontaneous correction is possible when cartilage is still immature. After that period, the deformity becomes permanent. The deformed joint will ossify, degenerate and bone hypoplasia is irreversible. This deformity increases the risks of partial luxation or fracture of the limb. Deformation of long bones. Growth inequality between the medial and lateral parts of long bones leads to an angular deformation of the limb, commonly in valgus or X. 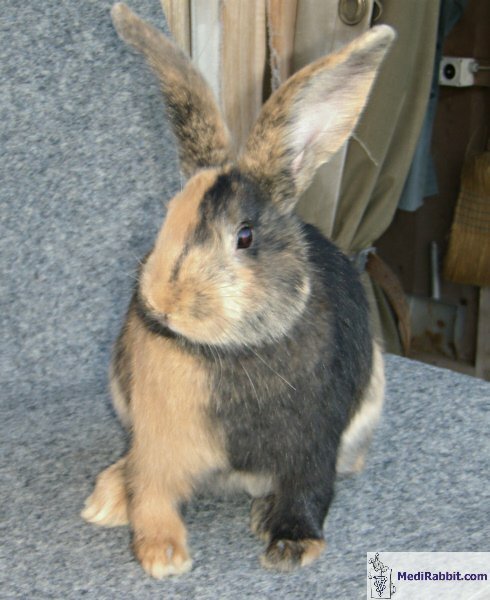 This deformity is present at birth, but may also appear later, during the growing phase of the young rabbit. In foals, positioning in the uterus is suspected to cause an abnormal compression of the growing cartilage during gestation. Le caused trauma lead to unequal growth of long bones. This type of deformity does not cause pain. Preterm offspring and overweight. Joint deformation is also observed in animals that are born prematurely, before calcification of bones takes place. Weight of the newborn can lead to angular deformity of joints. A similar problem is observed with single born rabbit kits. They have a bigger size at birth, with a strong bone structure and a rapid growth as they are well-fed by the does. 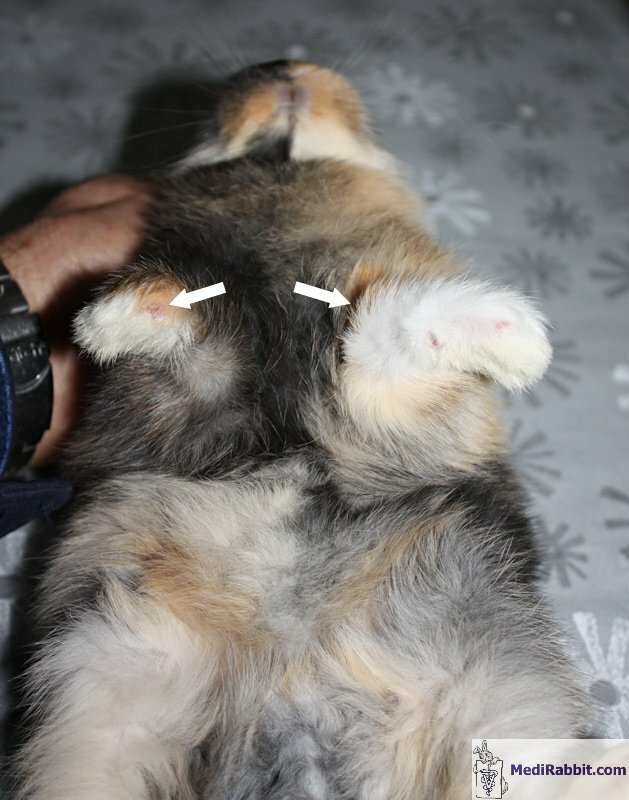 Young 24 day’s old rabbit suffering from deformed X limbs (valgus) of both upper limbs. Front and lateral views of a 3 months old rabbit with lateral 0-deformation of both front limbs and possible hypermobility of the ligaments. 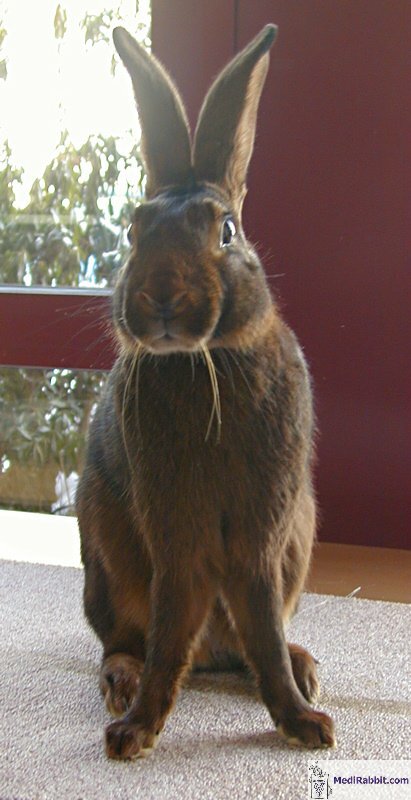 Heaviness is suspected in this case, as this rabbit weighed already 2.7 kilos (5.9 lb.) at that age. Radiographs of the affected limbs could have helped determine the exact cause of the curvature. 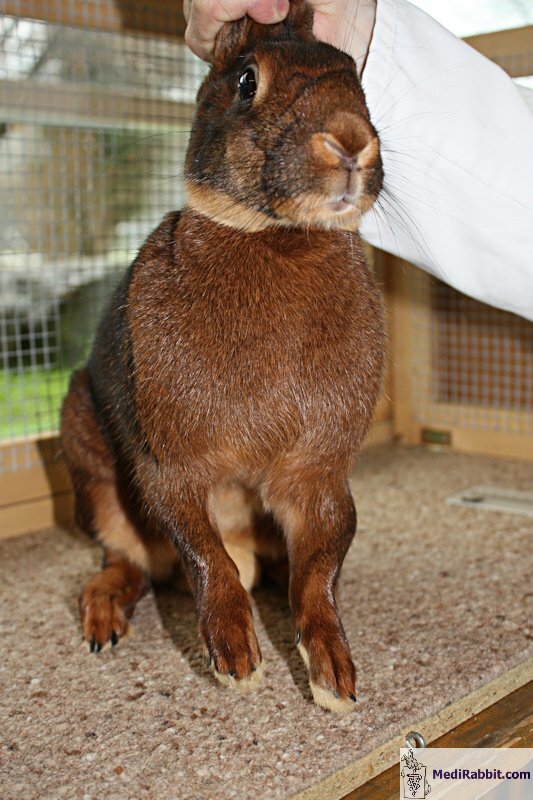 A rabbit suffering from deformed X or O-legs have a normal appetite and are in good health. The sole clinical signs are an abnormal or a difficult gait. 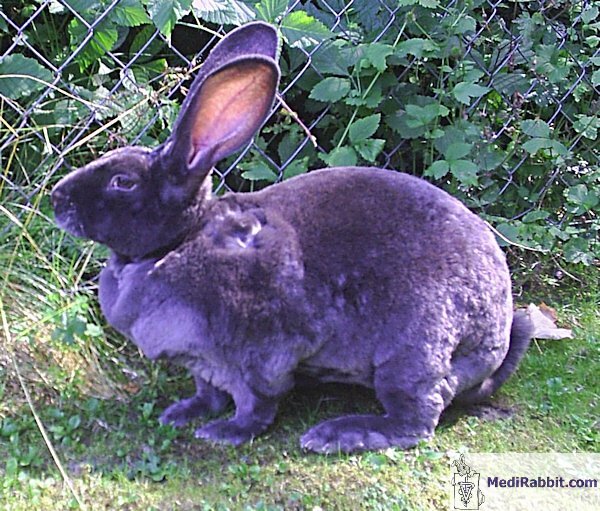 A rabbit that presents articular deformities is examined from the front, from the side and from the back, at rest and during exercise on a non-slippery surface. Palpation of the limb helps evaluate the presence of physical deformities, of pain, swelling, etc. The radiographic evaluation of limb bones and joints allows identifying the origin: primary congenital cause or secondary to an osteo-articular trauma. The front view must be perfect in order to detect lateral joint deformities. In the case of sagittal deformation, front and side views are necessary. If the problem is discovered at a young age, a splint or rigid bandaging of the affected limb may help correct the deformation. Movement and exercised possibilities of the young rabbit should not be limited, in order to help develop muscles in the limbs. There is no treatment for deformed limbs in rabbits. Amputation of the affected limbs may be helpful when it hinders movement and exercise of the rabbits or when it causes pain. When the curvature and deformation of the limbs is severe, euthanasia should be considered. Indeed, secondary complications of the skin may appear in region that supports the weight of the body. Ulceration of the skin (very painful) and pododermatitis are often observed. Many thanks are due to Michel Gruaz (Switzerland) and to Stefan Röthlisberger (Switzerland) for their gracious permission to use their pictures in this article. Arendar GM, Milch RA. Splay-leg - a recessively inherited form of femoral neck anteversion, femoral shaft torsion and subluxation of the hip in the laboratory lop rabbit: its possible relationship to factors involved in so-called "congenital dislocation" of the hip. Clin Orthop. 1966;44:221-9. Wilson DG. Les déformations angulaires des membres chez le poulain: prise en charge et conséquences de l’angulation sur la performance athlétique. la médecine vétérinaire des grands animaux. Rondes cliniques. Vol 6, 2006.